With public transport free today, it looks like some are taking advantage — there seemed to be more Seniors on the train this morning, enjoying a free trip into the city (even though it’s only $3.40 normally). But overall the train wasn’t markedly more crowded than usual, and it’s not like everyone abandoned their cars for the day. Many simply don’t have PT that is anywhere near time-competitive with driving, even if it’s free. 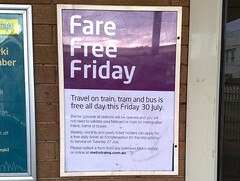 So what’s the real cost of today’s Fare Free Friday (making up for, as one wag put it, No Trains Tuesday)? The Minister said it would be “something upwards of $1 million”. I think it’s closer to two million. How much is fare revenue? Fare revenue formulas have changed now, and I haven’t dug around to get more recent exact figures, but the old formula from last year is a quick easy way of checking it. The old formula was a 40/40/20 split; 40% to Connex, 40% to Yarra Trams, and 20% to the government to pay for buses. Page 7 of Track Record 40 (July-Sep 2009, the last full quarter before the new contracts came in) shows a farebox payment of $60.95m to Connex for the quarter ending Sep-09, that being their 40% share. Page 8 also shows the V/Line fare revenue, which is $18.19m for the quarter (again, it’s trending upwards), or about $73 million for a year, making total metropolitan+V/Line revenue about $682 million. So how much is free travel costing today? Divide that by 364 days per year (because Christmas Day is always free) and you get $1.87 million — and that assumes that weekday revenue is the same as weekend, which it isn’t. How about we assume that weekday revenue is 50% higher than weekend (though it’s probably much higher). Taking into account ten public holidays, that would make it $2.09 million for a weekday, and $1.39 million for a weekend day. One could theorise about how many people will inadvertently touch-on or validate and end up paying, and how many weekly/monthly/yearly and V/Line ticketholders will be claiming their free day’s travel. And one could also theorise that Authorised Officers (who check tickets) may not be rostered-on, or may take the day off, since they would have nothing to do — though in fact a large number of them help with general customer service at big events like tonight’s football (another reason more revenue will be lost today than the average day) and planned disruptions for improvement works. Some people may have moved their trips/outings/errands from another day to today, adding to the lost revenue. All in all I think it’s not unrealistic to say it’s probably around $2 million in cost to run PT free today. Could the money be spent better? I have no doubt people will claim their compensation, and some will enjoy travelling free today. And politically, the government had to eat humble pie. But I wonder if that $2 million might have been better spent on maintenance or upgrades, or planning to make the network more resilient to be able to isolate faults better in the future. The above figure of $682 million per year is the shortfall you’d need to make up if you made public transport free all the time. Less costs of Authorised Officers (inspectors) and running the ticket system ($135 million per year for the next ten years, and theoretically about $50 million after that). Let’s say about $500 million per year in funding you’d have to find to make the system free. 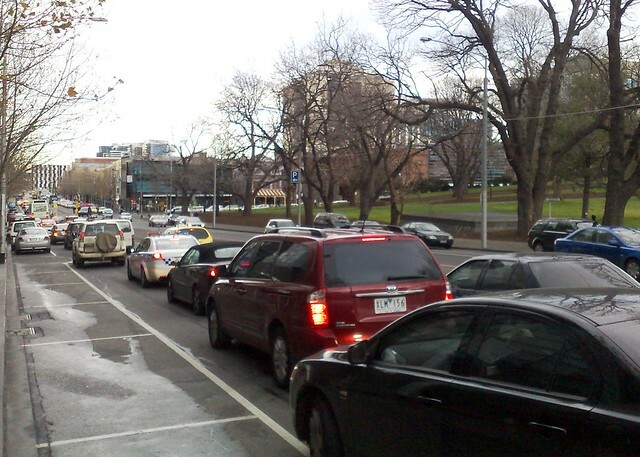 And as illustrated by the picture above, plenty of people would still drive — even into the CBD, because they don’t have good enough services to use, at any price. Remember there’s a difference between revenue and cost. They may have lost 2 mill in revenue, bit how much did it cost? Same as yesterday I would expect. Correct. In this context I’m talking only about the lost revenue. The cost of running services for the day isn’t relevant here, as it’s incurred whether or not fares are collected. It is with a great sense of shame – and a fairly clear indication as to my own mental state – that when I first saw this I thought it said ‘Fart free Friday’. Alas, such a thing isn’t really possible, is it? Just responding to the last bit – where’d you get $135mil p.a. for next 10 years from? $1.35bn is ALL of Myki’s costs, including the intial outlay and the extra $350mil tacked on later, all of which is irrelevant to day-to-day operations. @David, yes $1.35b is the establishment and running costs of Myki for 10 years, and IIRC some Metcard costs as well (to keep it running beyond 2007). If PT was fare-free all the time, it wouldn’t be needed, it would be $135m less spent per year; obviously $50m after that (though that’s too far in the future to really accurately guess). The point here is that even with a very expensive ticketing system, to make PT free, you’d still need to find at least half-a-billion dollars a year in funding to make up for no fares being collected. I’m wondering where all the money is coming from. Magically, the government now has a spare million or two for free travel…was that million there before? And what were they going to originally spend it on? It’s probably the million or so Metro will end up not getting as part of the poor performance on the day concerned. While this might seem all neat and tidy, this buck-passing (in every meaning) is exactly how privatised PT works. Didn’t they get fined, actually? That could be where the money came from. The $1m fine they’ve talked about is, as far as I can tell, the usual monthly fine/bonus for performance, which under the old contracts was limitless, but which is now capped at $1m per month. There’s no specific fine for Tuesday; all the delays just add into the monthly total. @Rob, yes, buck-passing galore these days! A fair number of people continued to validate on my trams to and from work. One woman went to another validator when a man tried to shoo her away from the validator (she couldn’t hear him because of her MP3 player so didn’t realise what he was doing). I have a weekly ticket and I just simply can’t be bothered trying to claim a free day for yesterday — I use it seven days and feel I get good value as it is. The usual large group of them got on my tram to work, causing some people to rush to the validators, but all they did was ride the tram a few stops then get off. I presume they still had to do their normal “rounds” and so just went joyriding. At Oakleigh railway station there were A4 sheets taped over the Metcard validators with text informing customers not to validate. I saw someone rip off one of the sheets and validate their Metcard. WTF? A bus I caught had a sheet taped to the Metcard validator AND the driver holding up a sign informing of the free travel. I observed during the day that many people were unaware of the free travel. Obviously some folk do not follow current affairs. Glad to see some fresh agitation re Southland station! As much as my inner misanthrope enjoys impotently cursing government inaction under my breath every time my train wooshes past Southland’s carpark, it really would be nice to see that no-brainer of a project completed within our lifetimes. Well, I caught my free early-bird train in to work as usual on Friday, with the knowledge that I got TWO free trips for the price of none ! I did notice an A4 sheet over the Metcard validators at Brighton Beach station, but no such cover over the myki posts. I left my myki at home so I wouldn’t accidently touch on when going home that evening.